Earning your initial certification or recertification hours is simple, convenient, and flexible through our interactive on-line training center. 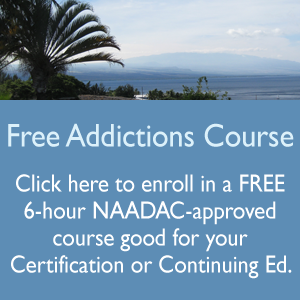 The Pacific Academy of the Healing Arts is an approved education provider for the National Association of Drug and Alcohol Abuse Counselors (NAADAC) and the Alcohol and Drug Abuse Division of the Hawaii Department of Health (ADAD). 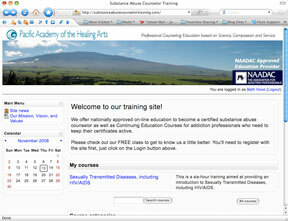 To view our Instructional Videos on how to access and use our on-line academy, click here. 1. Enroll in your course on-line. After you decide which courses you want to enroll in, you can purchase the courses directly through our on-line academy using our secure Paypal shopping cart. You will be immediately enrolled in your course. If you have not already entered the training site to sample our FREE course, you will need to create an account with a login and password so you can access the course material. If you would like to enroll in the full 15 course trimester, please see Tuition for a 20% discount. If you are ready to begin enrollment click here. 2. Read through the Course Material at your own pace. All the material for your course will be layed out in manageable topics, with direct links to important resources (pdfs and other websites). 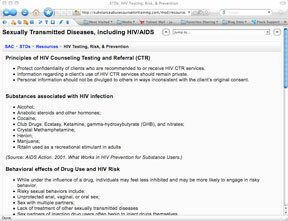 You also have the option to download the entire course lecture notes which you can go through off-line at your leisure. 3. Take the Final Exam on-line. Whenever you are ready you can log back into the on-line training site, and take your final exam. You will know the results immediately! 4. Complete your Course Evaluation on-line. To keep our program of the highest standard, we need all students to complete a course evaluation. But you can easily do this through our multiple choice on-line evaluation. 5. Print out your Certificate. After you pass your final exam, you will have the option of downloading and printing out your certificate. You will need this certificate to submit to your state board whether you are applying for initial CSAC certification or recertification.